There is nothing like the electricity present on a Broadway opening night. Those in attendance at film premieres often say the audience feels charged. In the theater, the actors have a chance to pick up on that. That energy impacts them on the stage. But before any of that happens, people have to get in the theater. A Broadway opening is like a smaller scale movie premiere -- photographers, videographers and interviewers still stand behind barricades waiting for celebrities to arrive, there are just fewer of them. The size varies based on the opening. 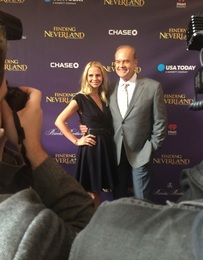 As Hollywood heavyweight Harvey Weinstein is the lead producer on Finding Neverland, and the show stars Matthew Morrison and Kesley Grammer, the opening night was quite the event. Yes, there were the theater press folk, such as photographers Bruce Glikas and Joseph Marzullo, but Entertainment Tonight also made an appearance beside the blue carpet (which was flecked with green glitter). A crowd gathered across 46th street to watch the festivities and those in passing tour busses leaned to get just the right photo. The guest list included Helen Mirren, Ansel Elgort, Olivia Wilde, Bryan Cranston (who also happens to be a producer of Finding Neverland), Darren Criss, Michael Bloomberg, Brooke Shields, Christoph Waltz, Sara Bareilles (soon to work with Neverland director Diane Paulus on the musical version of Waitress), Laura Benanti and Derek Hough (from the other Weinstein/Paulus collaboration, The New York Spring Spectacular) and the founder of The Huffington Post herself, Arianna Huffington. 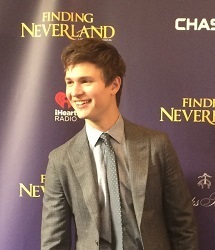 Like almost all openings, the Finding Neverland opening included a "step and repeat." 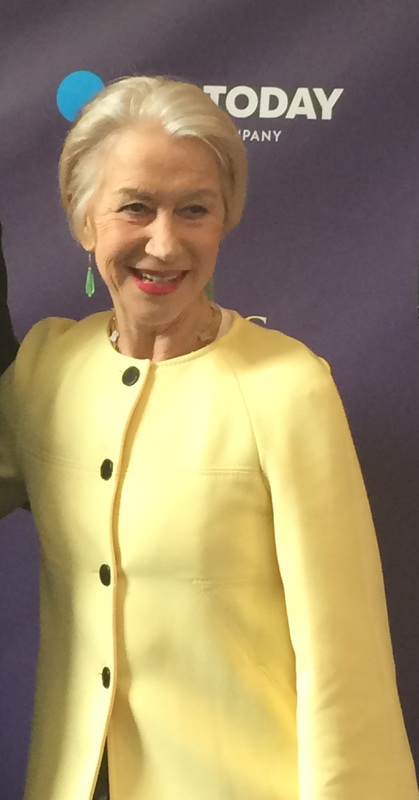 For those not in the know, a "step and repeat" is the backdrop that often appears behind folks in this type of photo; it sports the show's logo and the logos of various sponsors, if any. Often the actors in the show don't pose before the show, opting instead to get their photos taken on the way into the opening night party. However Grammer made an exception, taking photos with his wife outside the theater just shortly before half hour. (The dog that is in the show also made the same exception, as did that dog's swing.) 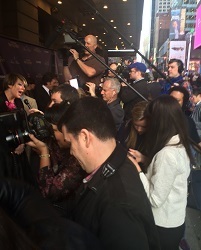 Of the guests to arrive in time to walk the blue carpet, Elgort got by far the biggest reaction from the crowd. Four girls, across the street and slightly to the side, spotted him before he even entered into view of the press, and loud squealing ensued. In fact they were so loud, one of the photographers thought sincerely a crime may have occurred. Wilde, dressed in an eye-catching off-white gown with fringe and flowers, was rushed by one fan with an Iphone. Many of those that arrived early spoke to news crews, giving the normal quotes about how excited they were to see the show, how they were friends with [insert name here] or how they were a fan of [insert name here]. Cranston, a Tony winner for his onstage work, was happy to be behind-the-scenes on this one. "You know what is great about this?" he asked rhetorically. "I don't have to perform. I sit." Those that didn't make it in time to walk the carpet before the curtain rose at the Lunt-Fontanne had another opportunity heading into the Metropolitan Club for the swank after-party. But what happens at those is a story for another time. Photos taken from my IPhone (from top to bottom): The scene in between the barricades. After the screaming subsided, Ansel Elgort posed solo for photographers. The Queen is here: Helen Mirren arrived on the scene. Photographers crowded in to get a photo of Kelsey Grammer and his wife before Grammer headed backstage. 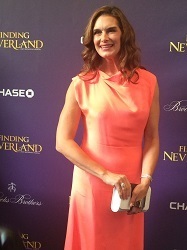 Brooke Shields looked just peachy as she entered the press line.